Sleeveless Top with sheer panel in navy floral and Pleated Skirt in navy floral; Trench Coat in black; Flared Dress in cream with black patent belt. We love a good deal. Who doesn't? And the slew of high-low pairings allows us to look good and save a few pennies. Our mothers are so proud. But often, the images splashed everywhere of the new H&M and Target collabs don't quite match up to reality. That dress you think will look so perfect on you ends up looking more like a burlap sack. Don't you just hate that? Jason Wu for Target is in stores and online February 5. A fair amount of the tops on offer have cap sleeves which are super cute for thinner frames. But those of us with a little more up top prefer to steer clear. This shirt shows the perfect amount of skin while still being flattering to your arms. Love it. A good trench is hard to find. This cute number comes in navy or black, and flares out so it fits over voluminous skirts and dresses. But be warned—the sizes tend to run a bit large. Who doesn't need a cute party dress? We grabbed the black version—as did many girls—and can't wait to find an excuse to wear it. Flirty and feminine—you need to put this in your shopping cart. Not everyone is a scarf person, but a good bit of fabric can tie a look together. Wu's scarves flew off the shelves. They're colorful, fun, and come at a killer price tag. Jason Wu's collection bags are pretty amazing so we were thrilled to see how great the Target bags were. In fact, we bought two. Load up, ladies. Plus, check out Jason Wu's Target commercial. 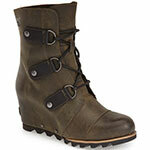 Warm, Cozy, Stylish Feet with the New Sorel ‘Joan of Arctic’ Boot!